Sports reporter Steve Hossack (left) catches up with former Dons head coach Tony Fisher. Former Dons head coach Tony Fisher will always be guaranteed a warm welcome at the Keepmoat Stadium having steered the club to the top flight for the only time in their history in 1994. Fisher, who travelled up from Swansea to be reunited with some of his former charges, had the honour of leading out the two teams - along with New Zealander Sonny Whakarau - prior to the start of Sunday's League One clash against Oxford. The appearance of the likes of Whakarua, making his first visit to the UK for nearly 20 years, and other players from that era, will have brought back fond memories of the time when the club won promotion to, and briefly topped, what was then the Stones Bitter Championship. Sacked during what turned out to be an ill-fated season for the club after they had won three of their opening four games and pulled in a club-record crowd at Tattersfield of 6,000 plus, Fisher claimed it would be more difficult to repeat the club’s success in this day and age. “There’s not the players available now as there was back then,” said Fisher, who picked up a number of players - including fans’ favourite Whakarau - at bargain prices. There is no doubt, however, that Fisher would have relished being based at the club’s current home and enjoyed the financial stability provided by membership of Club Doncaster, given the outdated facilities at Tattersfield and essentially the financial backing of just one man. The club’s stated aim remains to bring Super League to Doncaster, but current head coach Gary Thornton is looking no further than trying to get the Dons back into the Championship at the first attempt – something he says is not made any easier by the arrival of the full-time Toulouse side. 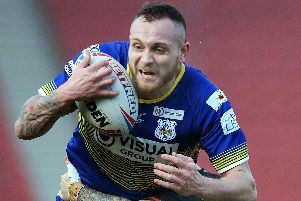 Thornton is a supporter of the current promotion and relegation format, though he conceded this week that the RFL would probably have to review it were no Championship side to win promotion to the Super League within the next few years.